Generation X is sometimes dubbed ‘The Divorce Generation.’ We were children of an era plagued by divorce. 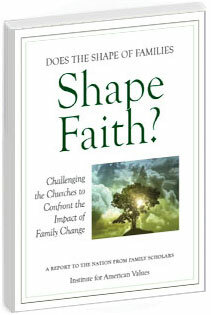 A new report on divorce’s impact on faith says Gen X children of divorce “form a kind of broken leading edge, with spiritual stories quite often characterized by loss or suffering.” If we turned to God for solace when our parents split, we might consider ourselves spiritual. But we report more trouble practicing faith within religious institutions. In [a national study], of those young adults who regularly attended a church or synagogue at the time of their parents’ divorce, two-thirds say that no one—neither from the clergy nor the congregation—reached out to them, while only one-quarter remembers either a clergy member or congregant doing so. If we dig deeper into the inner lives of children of divorce, we learn even more. Scholars observe that children of divorce experience a disruption of the “domestic church” of their home. If they become alienated from formal religious practice they can experience a second silent schism in their lives—the first being the rupture of their parents’ marriage, and the second being the rupture of the child’s connection to a congregation and even to a life of faith. Courtesy of the Center for Marriage and Families. Most of the findings and statements above are true for me. I didn’t realize how deep my divorce wounds were until I was married. I’ve struggled to trust my husband. I trust my friends more than anyone–especially those from college, a time when I regained, through them, a sense of family. My close cadre of college friends became my domestic church, as the report suggests. As I mentioned in my last post, my parents’ shattered union is still a mystery. I’ve long been challenged to find a church that feels like home. There are two exceptions. The tiny church in Arlington, Va., where I was married, and the massive Moody Church in Chicago. They’re markedly different places. But both offered me a sense of acceptance and unconditional love. I’m still hesitant to get involved, to trust and worship in these formal institutions. I suspect that part of this trouble stems from the fact that I didn’t spend much time in church with an intact family. The time I did spend was with my mom and her friends, mostly post-divorce. Children of divorce stumble on emotional wreckage too early in life. Yet we have much to offer despite–and more likely because of–that stumbling. God can take a generation’s broken edge and turn it into something glorious. For the future. Here’s to helping Him do it. I’m forwarding this on to a pastor friend of mine who will take it to heart with regard to his church and its practices. Thanks.